Get rid of ads powered by OptiBuy, learn why this app is categorized as adware and what kind of problems may ensue from its activity on an infected Mac. It’s not uncommon for adware programs to have “official” websites set up. The one under scrutiny is no exception. Incidentally, its homepage is a replica of the site for SurfBuyer, which is another ad-injecting virus from the same lineage. 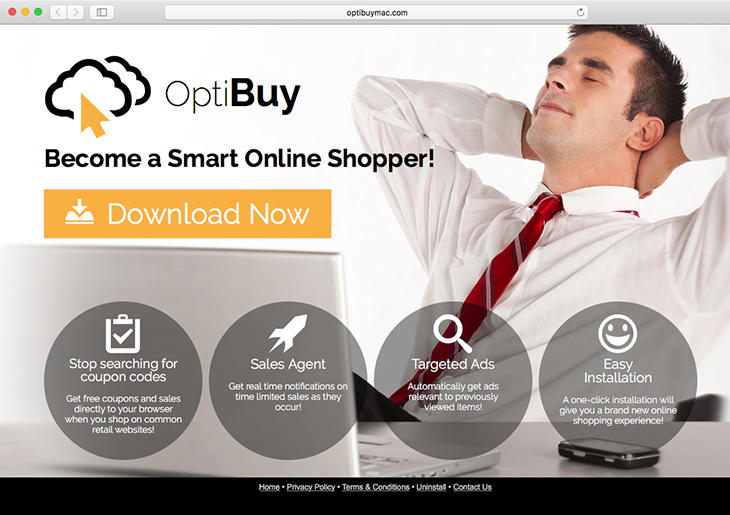 There is a great deal of sarcasm in OptiBuy’s motto that reads, “Become a Smart Online Shopper”. The web page also has some legal implications. Its Terms & Conditions section actually gets the true gist of the adware straight, emphasizing that it’s free to use but ad-supported. However, there is hardly any chance for users to peruse the EULA as the application is being installed. The reason is that this ad-serving malware propagates by means of a tricky mechanism called bundling. It slithers its way into a Mac alongside other programs, which tend to be harmless and free of charge. So would-be victims never get to authorize the potentially unsafe setup, simply because they are unaware of the menace taking effect behind the scenes. Another possible entry point for OptiBuy trespass revolves around the use of such rogue programs as MySoftUpdate or MacUpdater. When running on a Mac, these malicious apps can promote opportunistic infections camouflaged as critical software updates. OptiBuy utilizes persistence techniques to stay inside a contaminated Mac computer and thwart removal through commonplace methods. Consequently, eliminating the associated browser plugin or extension is not going to fix the problem altogether. The underlying process that resides deep down the system will keep executing the bad routine over and over. This is why victims need to think and act out of the box to perform troubleshooting in such a scenario. The tips below address this jeopardy and will help remove ads by OptiBuy from an infected Mac. When confronted with malicious code like OptiBuy/MySoftUpdate/MacUpdater, you can neutralize its toxic impact by leveraging a specially crafted system utility. The Freshmac application (read review) is a perfect match for this purpose as it delivers essential security features along with must-have modules for Mac optimization. This tool cleans unneeded applications and persistent malware in one click. It also protects your privacy by eliminating tracking cookies, frees up disk space, and manages startup apps to decrease boot time. On top of that, it boasts 24/7 tech support. The following steps will walk you through automatic removal of the OptiBuy virus. 4. Check whether the OptiBuy problem has been fixed. If the ads are still popping up, go to the Uninstaller option on Freshmac GUI. Select the entry for OptiBuy and click Fix Safely button to force-uninstall the unwanted application. 5. Go to Temp and Startup Apps panes on the interface and have all redundant or suspicious items eliminated as well. The OptiBuy virus shouldn’t be causing any further trouble.